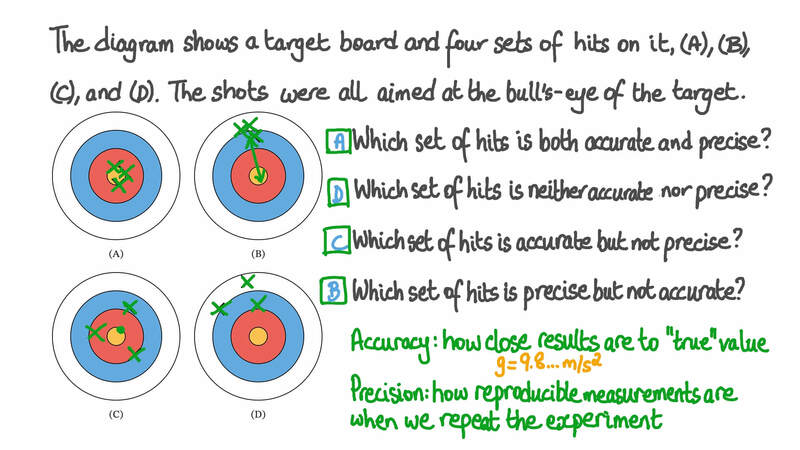 In this lesson, we will learn how to define measurement accuracy and precision and explain how different types of measurement errors affect them. The diagram shows a target board and four sets of hits on it, (A), (B), (C), and (D). The shots were all aimed at the bull’s-eye of the target. Which set of hits is both accurate and precise? Which set of hits is neither accurate nor precise? Which set of hits is accurate but not precise? Which set of hits is precise but not accurate? Which of the following statements most correctly describes how zero measurement errors affect the accuracy and the precision of measurements? AZero errors decrease measurement accuracy. BZero errors decrease both the accuracy and the precision of measurements. CZero errors do not affect measurement accuracy or measurement precision. DZero errors decrease measurement precision. Which of the following statements most correctly describes how systematic measurement errors affect the accuracy and the precision of measurements? ASystematic errors decrease measurement accuracy. BSystematic errors decrease both the accuracy and the precision of measurements. CSystematic errors do not affect measurement accuracy or measurement precision. DSystematic errors decrease measurement precision. Which of the following statements most correctly describes how random measurement errors affect the accuracy and the precision of measurements? ARandom errors decrease both the accuracy and the precision of measurements. BRandom errors decrease measurement accuracy. CRandom errors do not affect measurement accuracy or measurement precision. DRandom errors decrease measurement precision. Which of the following statements most correctly describes the meaning of the precision of measurements? AThe more precise the measurement of a quantity is, the smaller the predictable change that can be made between the measured value and other measured values of the same quantity. BThe more precise the measurement of a quantity is, the closer the measured value is to the actual value of the measured quantity. CA precise measurement is made using a correct measurement method. DA precise measurement is more accurate than an accurate measurement. Which of the following statements most correctly describes the meaning of the accuracy of measurements? AThe more accurate the measurement of a quantity is, the closer the measured value is to the actual value of the measured quantity. BThe more accurate the measurement of a quantity is, the smaller the predictable change that can be made between the measured value and other measured values of the same quantity. CAn accurate measurement is made using a correct measurement method. DAn accurate measurement has a value that is the same value when a quantity is repeatedly measured.